There was a period in the history of emergency medicine when cricothyrotomy was the primary airway management strategy for all patients in cervical spine precautions. We have since learned that most of these patients can be intubated orally, but in the intervening years have lost our nerve when it comes to using the neck for airway access. Today, everyone agrees that the most important error around emergency cricothyrotomy is that it is performed too late [1, 2, 3]. An unsuccessful cricothyrotomy performed at the right time is defensible; a successful cricothyrotomy performed too late is indefensible. Both lead to terrible outcomes: one is good, defensible care, the other is poor, indefensible care. The pivotal element in emergency surgical airway decision-making is giving yourself permission to initiate the procedure before the patient is dead. There are a variety of strategies for accessing the trachea via the neck and the terminology is confusing. Open cricothyrotomy, often referred to as surgical cricothyrotomy, is using a knife to cut a hole in the cricothyroid membrane and placing a tracheostomy tube or endotracheal through that hole. Several techniques have been described, including the no-drop technique, the rapid four-step technique, and the scalpel-bougie technique. Percutaneous cricothyrotomy is a term usually used in distinction to surgical or open cricothyrotomy, implying a less invasive approach. Percutaneous cricothyrotomy facilitates the placement of a tracheostomy or endotracheal tube in the trachea by using either a Seldinger tube-over-dilator-over-wire technique, or a tube-over-trocar device [1, 2]. Most emergency physicians are referring to the Seldinger technique when they use the term percutaneous cricothyrotomy. Though a needle is used in the Seldinger technique, the term needle cricothyrotomy usually refers to a less definitive procedure where a comparatively small cannula, such as a 14g angiocath, is placed into the trachea and oxygen is insufflated under pressure through the cannula; this is called transtracheal jet ventilation when a special high-flow device is used, though a bag-valve-mask is more likely to be available, if less effective, and several hard to remember maneuvers are commonly proposed that allow a BVM to be adapted for this purpose. For patients who suddenly and unexpectedly cannot be intubated or oxygenated, the weight of evidence and opinion seems to favor an open technique [1, 2, 3, 4, 5], which appears to be faster than a percutaneous approach, more likely to be successful for those who don’t perform the procedure often (i.e. everyone), and would be used to rescue a failed percutaneous attempt. Smart people disagree on this point, however. Certainly, the goal in these scenarios is to establish oxygenation as quickly as possible by whatever means necessary, and that will differ based on provider, patient, and setting. Have a plan that works for you in your environment. Many patients who cannot be intubated orally do not suddenly and unexpectedly crash, however. The need for a surgical airway can present itself as a land mine that explodes in front of you as you walk to your mailbox in your bathrobe, but also as a land mine that explodes as you carefully traverse a known minefield in a tank. Of course every emergency intubation is a minefield, and being cognitively and materially prepared for failure of intubation and failure of ventilation at the outset of every case is one of the characteristics of the airway expert. 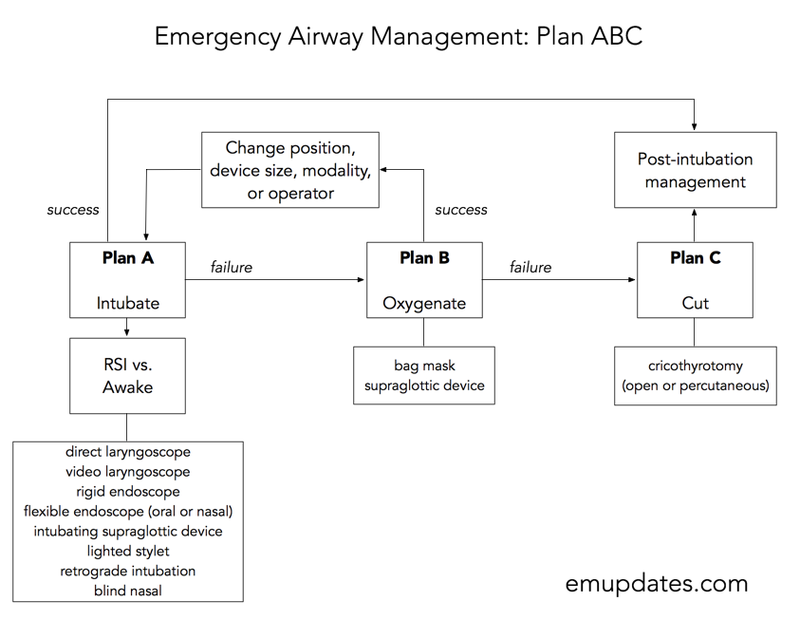 But while we have many options for plan A and plan B, there is still only one plan C – when intubation fails, and oxygenation fails, plan C is cricothyrotomy. 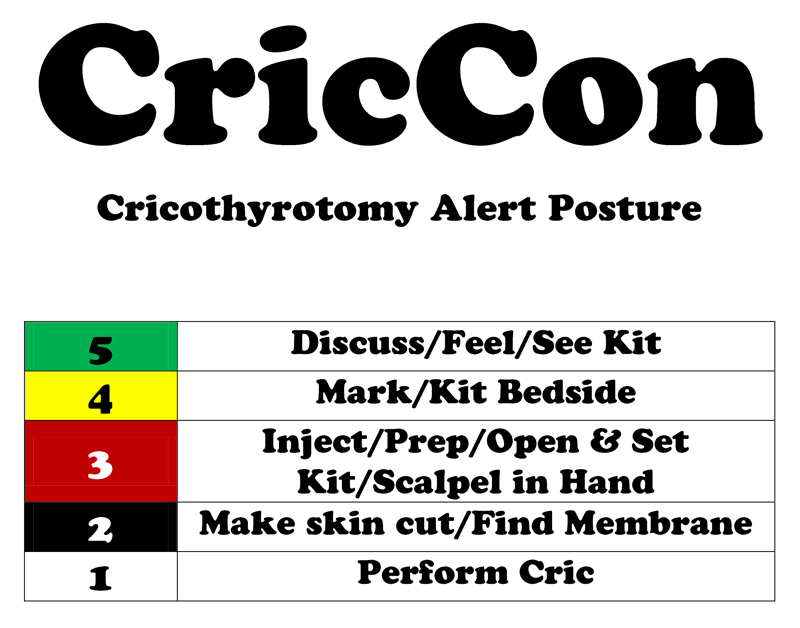 Since it is clear that the most important surgical airway error is that it is delayed, several airway management paradigms [1, 2, 3] have recently emerged that explicitly encourage providers to prepare for and properly initiate cricothyrotomy. In Scott Weingart’s CricCon taxonomy, the highest alert posture is to cut the skin and find the membrane, so that if the need arises, incising the membrane and placing the tube is simple. Most emergency practitioners, however, are uninterested in cutting the neck. On the other hand we are perfectly happy to put wires and tubes in the neck, and do it all the time in the internal jugular vein. Here lies the role of percutaneous cricothyrotomy: not as a crash technique, but as an alert posture, a readiness maneuver: when the likelihood of requiring a surgical airway is sufficiently high, place a wire in the trachea. Placing a wire in the trachea feels more like inserting a central line than cutting the neck. Feel free to use ultrasound. [1, 2, 3] The strength of the wire-in-trachea approach is that it lures the practitioner into preparation and makes timely performance of cricothyrotomy more likely by breaking the procedure into agreeable steps. Inclination via incrementalism. a. An almost crash expected very difficult laryngoscopy, such as an angioedema patient who requires an airway not this very second but urgently. If the patient is cooperative, wire is placed after rapid local anesthetic infiltration as preparations are being made for awake laryngoscopy vs. RSI. If uncooperative, wire is placed immediately after induction (concurrent with preoxygenation if using a delayed sequence strategy), just before laryngoscopy, or as laryngoscopy is beginning. This is basically an enhanced double setup. b. In the midst of a can’t intubate, can ventilate situation. This occurs relatively commonly: laryngoscopy has failed, but LMA or bag-mask ventilation is effective, then the second laryngoscopy attempt fails, but ventilation remains effective, and then the third attempt fails, and you feel like you’re running out of tricks/tools. And you know that with every airway attempt, the glottis becomes a little more swollen, the airway gods–who have until now granted you the gift of ventilation–their patience is a little more tested, and the prospect of can’t intubate, can’t ventilate looms. So after a few failed oral attempts, while the patient is being ventilated, place the wire, then go on with as many further attempts as you want, knowing that if and when ventilation becomes ineffective (or if you have other patients to see and want to move on), cricothyrotomy is straightforward. Percutaneous cricothyrotomy kits are expensive and often stocked in small numbers. 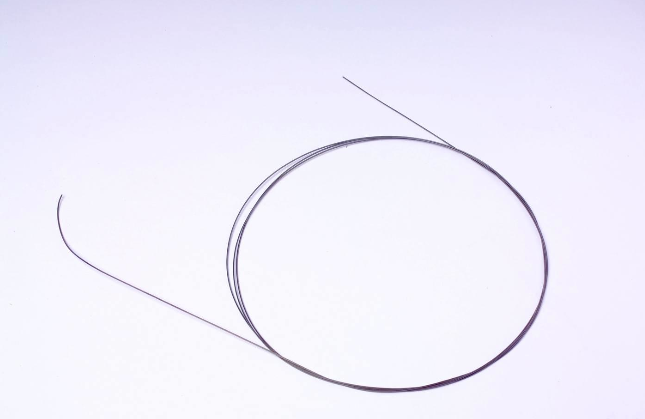 To utilize the wire-in-trachea readiness technique, use the needle/syringe/wire from a central line kit. Fill the syringe halfway with water/saline so that tracheal location of the needle can be confirmed by the bubbling of aspirated air. Have your unopened percutaneous cric kit at the bedside, and when needed, 1) open the kit 2) stab the skin with the scalpel 3) slide the tracheostomy tube-over-dilator into the trachea 4) pull the wire and dilator 5) inflate the cuff 6) ventilate. Don’t forget to load the tracheostomy tube onto the dilator if not pre-loaded in your kit. Step 2 is important: an aggressive stab must be made on the skin, along the path of the wire, similar to central line technique but larger, to accommodate a larger device. Step 3, inserting the tube-over-dilator, is facilitated, like everything else, by the application of sterile lubricant. Use a firm twisting motion. If oral or nasal access is successful and cricothyrotomy isn’t needed, simply pull the wire. Put a band-aid on the site; this will serve as evidence of a disarmed land mine. Thanks to Rob and Scott for helping me develop this idea.